the hormone of the anterior lobe of the hypophysis that governs the nutrition and growth of the adrenal cortex, stimulates it to functional activity, and shows extraadrenal adipokinetic activity; it is a polypeptide containing 39 amino acids, but exact structure varies from one species to another; sometimes prefixed by α to distinguish it from β-corticotropin. The first 13 amino acids at the N-terminal region are identical to α-melanotropin. a hormone of the adenohypophysis that stimulates growth of the adrenal cortex and the synthesis and secretion of corticosteroids. 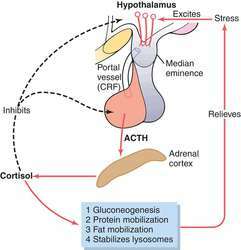 ACTH secretion, regulated by corticotropin-releasing hormone from the hypothalamus, increases in response to a low level of circulating cortisol and to stress, fever, acute hypoglycemia, and major surgery. Under normal conditions a diurnal rhythm occurs in ACTH secretion, with an increase beginning after the first few hours of sleep and reaching a peak at the time a person awakens and a low in the evening. ACTH may be used in the treatment of rheumatoid arthritis, multiple sclerosis, and myasthenia. Normal ranges are from 15 to 100 pg/mL (10 to 80 ng/L) in the morning to less than 50 pg/mL (50 ng/L) in the evening. Normal values vary by laboratory. Also spelled adrenocorticotrophic hormone, corticotropin. A gene on chromosome 2p23 that encodes proopiomelanocortin, the melanocortin family of hormones, which include alpha-, beta- and gamma-melanocyte stimulating hormone (MSH) and adrenocorticotropic hormone (ACTH). The melanocortins bind to the melanocortin receptors, a group of five G protein-coupled receptors (MC1R to MC5R) which are involved in a wide range of physiological functions, including pigmentation, energy homeostasis, inflammation, immunomodulation, steroidogenesis and temperature control. Defects of POMC are associated with susceptibility to obesity and proopiomelanocortin deficiency. The hormone of the anterior lobe of the hypophysis that governs the nutrition and growth of the cortex of the suprarenal gland and stimulates it to functional activity; also possesses extraadrenal adipokinetic activity. Also called corticotropin, this hormone is produced by the pituitary gland to stimulate the adrenal cortex to release various corticosteroid hormones. n anterior pituitary gland secretion that encourages growth of the adrenal cortex as well as cortico-steroid secretion. Increased levels of the hormone occur in response to stress, low cortisol levels, fever, acute hypoglycemia, and major surgery. Hormone of anterior lobe of hypophysis that governs nutrition and growth of the adrenal cortex, stimulates it to functional activity. having a stimulating effect on the adrenal cortex; corticotropic. acth, a hormone secreted by the anterior pituitary gland which has a stimulating effect on the adrenal cortex. Called also corticotropin.